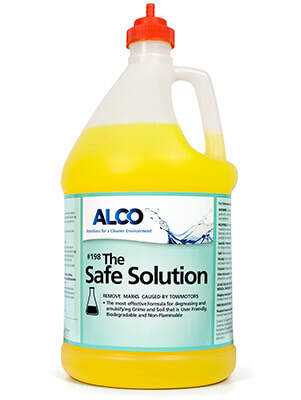 Alco Safe Solution Closed Loop - Alco-Chem, Inc. Designed for emulsifying grime and soil. This specially designed degreaser contains citrus turpine. Formulated for emulsifying grime and soil on warehouse concrete floors. This user friendly degreaser will do the job on daily cleaning of stubborn caked oil grease. Excellent for grout on kitchen floors.